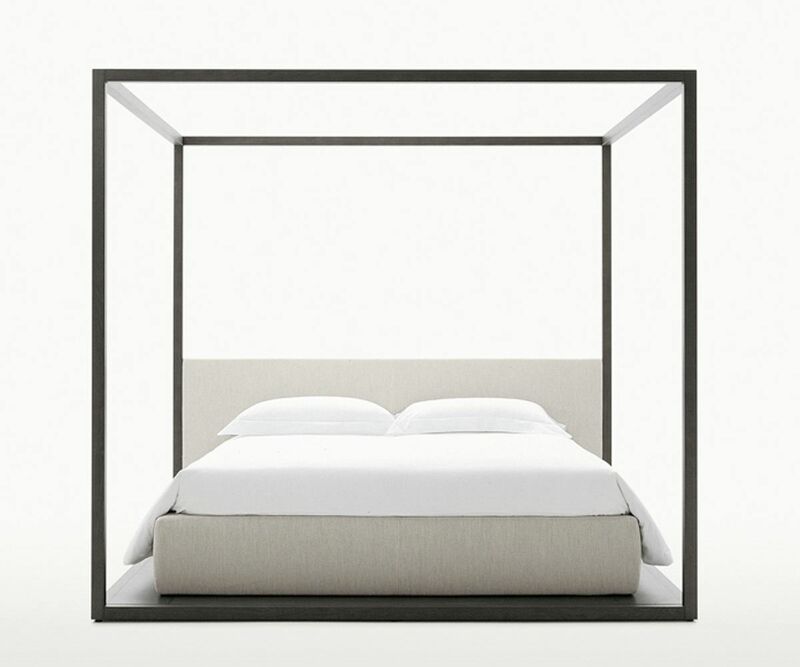 THE CLASSIC CANOPY BED IN A MODERN INTERPRETATION , SUITABLE TO BE POSITIONED MID-ROOM; BASE FRAME AND HEADBOARD IN LEATHER OR FABRIC. THE BED RESTS ON A PLATFORM WHICH IS LARGE ENOUGH TO POSITION A STORAGE ELEMENT WITH AN OPEN COMPARTMENT AND A DRAWER AT THE FOOT OF THE BED. ONE SINGLE LARGE SIZE AND FOUR DIFFERENT FINISHES: BRUSHED LIGHT AND BLACK OAK, GREY AND BROWN OAK.